On March 6th 2015, Gigabyte officially released four (4) new motherboards in their X99 Champion series. Among the releases was the new X99 Gaming 5P. A no compromise X99 gaming motherboard with great OC capabilities, professional grade audio, and support for faster DDR memory. 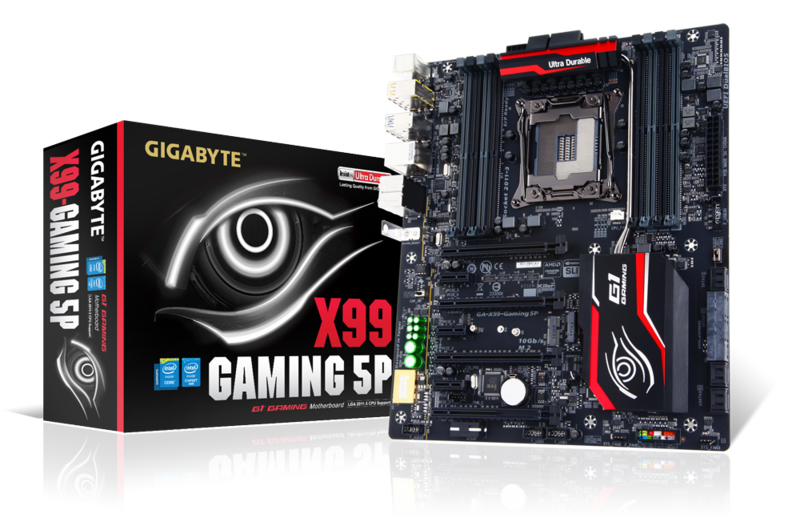 Like all of the X99 Gaming motherboards from Gigabyte, the X99 Gaming 5P features an all digital CPU power design from International Rectifier. The board also features server level chokes, and long lifespan Durable Black solid caps for extended reliability. The Gaming 5P also comes equipped with a 30 micron thick gold plating on the PCIe slots, the DIMM slots, and most importantly the CPU Socket. The Gaming 5P features a socket switch similar to that of the SOC Champion motherboard. The switch allows users to choose between socket 2011 or enable the extra pins and have the socket use all 2083 pins (Socket 2083). Along with great OC capabilities, the Gaming 5P also has support for DDR4 XMP profiles of up-to 3333MHz. The motherboard also has up-to 4 way SLI/CrossFire support so all you gamers should not have any issues getting all the horsepower needed to push all your games to the max. For Audiophiles out there, the motherboard features Gigabyte exclusive AMP-UP Audio Technology along with an up-gradable OP-AMP. The analog audio circuit is separated from the motherboard using Audio Noise Guard with separated left and right audio channels. Keeping up with the growing trend of heat-sink lighting, the motherboard has its heat-sink light up. And also includes a nice light up IO shield so you no longer have to fiddle in the dark. Gigabyte also added a dual M.2 slot that allows you to install a M.2 SSD, and a 11AC WiFi card. Users will no longer need to make a choice between using a M.2 SSD, or a WiFi card. For those who are interested in using SATA Express, the board features an on-board connector as well. Add on a Qualcomm Atheros Killer E2200 Ethernet controller for better gaming and media performance, you end up with a “Killer” combo of connectivity, and storage solutions. In the coming weeks we will be taking a deeper look at the new X99 Gaming 5P motherboard. Keep an eye on the zoo for more details in the coming days. This really does look like a “no-compromise” board. I can’t wait to see what people can do with the new lineup of x99 boards, especially these ones from Gigabyte.